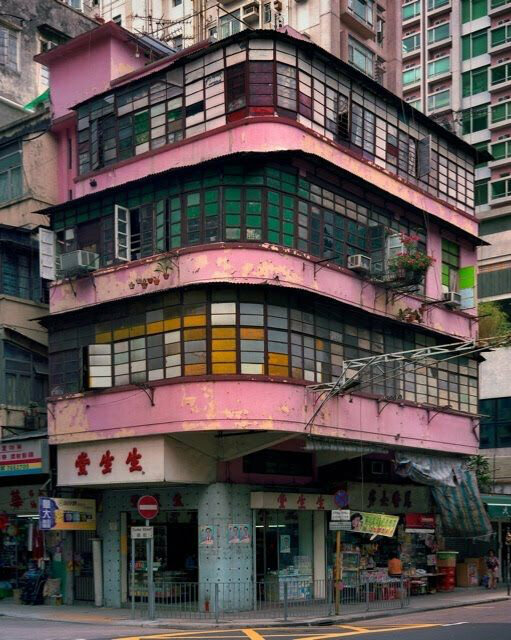 During the typhoon season, one suddenly realizes the practicality of Hong Kong old architecture. Indeed, street extensions of the 1950s composite buildings, help keeping your clothes dry during the heavy rain falls of July and August. Enclosed balconies also provide shadow during the hottest days of the year. This empirical architecture was developped to accomodate a booming migrant population and reminds us of our own middle-age houses, which also overlooked the streets, although the "rain" by then was a human one with throwing out the night buckets from the windows. Today, those iconic houses tend to be replaced by more symetric buildings, to meet security and hygiene standards, with direct consequence on street pedestrians who have to find cover in the subway or elevated passage-ways not to be soaked when they getting to work! 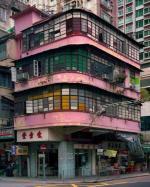 This dramatic change of the urban landscape has led a goup of nostalgic hongkongers to try and reproduce some of these iconic old buildings, which have already been torn down for some. I was lucky to meet with Tony and Maggie (video), two passsionate artists who spend their time recreating the Hong Kong of the past through highly detailed miniatures. 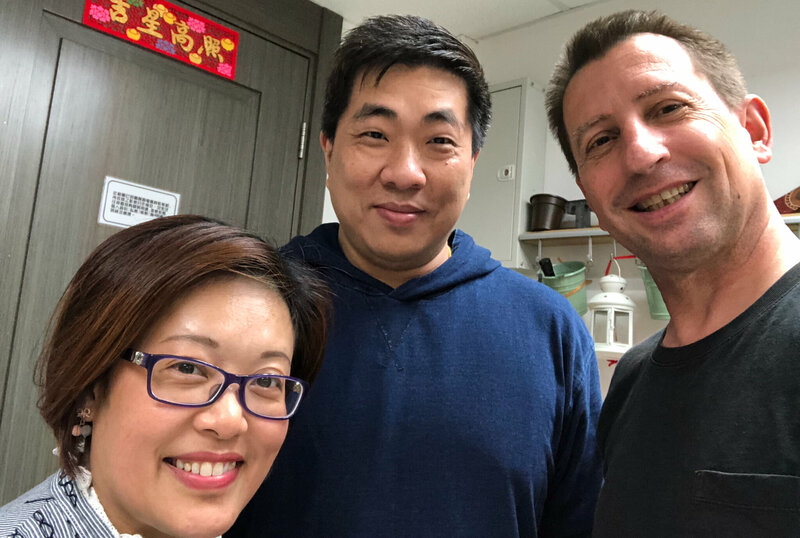 Although it was difficult to exchange through email or social networks in the first place, as none of them is fluent in Mandarin or English I would discover later, I decided to go and visit them in person. I initially thought I would find some kind of exhibiting gallery but when I got there, I was surprised that their workshop was located in a former industrial building near Kai Tak, which had been converted into working spaces for small size companies. After hesitating, they finally introduced me to their Ali Baba cave, containing many reproductions of old pawn shops or Hong Kong early squatter huts. Both of them soon drew my attention on some of the stunning details of their creations, which include street food and dishes and, best of all, electronic devices like a working TV set (video) broadcasting popular programs of the 1960s and a pick-up record-player with old songs (video). Each of the buildings reproduction takes up to two months to complete and often requires the studying of old photo archives or field investigation. 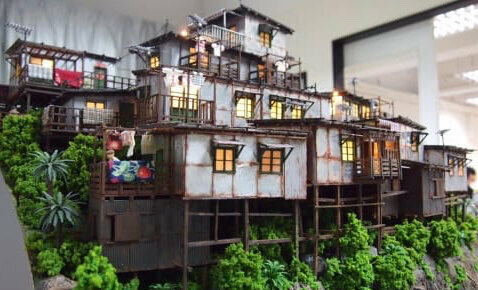 "The aim of making old Hong Kong models is to pass over the memories of the past to young generations", they say. 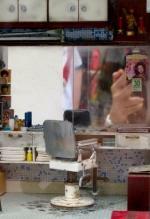 Among my favourite scenes are indeed the interiors od tea restaurants, also called "cha chaan teng", where up to the brand of the condensed milk can be identified on the cans, or the Shanghai style barber shops pedal- chairs, like those who still survive in North Point today. Most of the creations have been documented on exhibition catalogues, social medias or TV programs but there is little left in Tony and Maggie's workshop. Most extraordinary pieces have already been sold, an indication of the success met by this initiative. 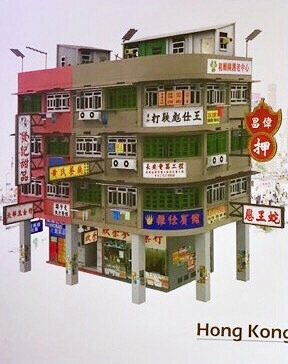 After I have published the videos of animated models on Facebook, I was myself agreably surprised to receive connection requests from some of the artists many supporters, who include neighbourhood shop keepers and Chinese families living on the Kowloon side. Quite touching! Further to this meeting, I wanted to know more and rapidly found out that other passionate hongkongers had started making reproductions of old Hong Kong. This is case of the company Tiny, whose staff average age obviously does not exceed 30, which manufactures diaoramas of classic street life, old garages or composite buildings (above). They founders of this brand are the pursuers of Hong Kong tradition for making toys which started in the 1960s, as an early type of industry in the striving city. Let us not forget that Li Ka-shing, the richest man of the former British colony, starting to work at making plastic flowers in the 1950s before producing the world-famous male doll G.I. Joe in his own factories. Today still, Hong Kong International Toy Fair is the largest event of this kind in Asia. Old Hong Kong miniatures can be found in almost every small neighbourhood toy shop in town, through internet-buying or even at the wonderful boutique of the History Museum, obviously meeting a large success! The search for Hong Kong's past seems a reccuring concern, as I recently realized. My local language exchange partner, who grew up in Yau Ma Tei, indeed told me that he was participating in a Facebook group called "Hong Kong in the 60s", which exhibited vintage photos. When asked him why, he explained to me that he liked to recall of the pre-retrocession period. "Times were though but anyone had a fair chance to make it, whereas nowadays the future of the territory lies in the hands of small group of people with the right connections". I decided to check this group by myself and was amazed to discover some 14000 subscribers. When I posted a simple photo of the Beatles landing in Kai Tak in 1964, it immediatly attracted 150 "likes" during the night with additional 60 comments, showing how dynamic exchanges are on this site! The recent efforts to document Hong Kong's past reveal today's people's fears of the future as well as their concern for preserving both culture and identity threaten by the fast changing environment.